Our paralegal, Ashley Lindsley, accomplished something truly incredible. Ashley is a novice bowler, who bowls no more than twice/year. On Friday, October 20, 2017, Ashley went out for some glow-bowling (bowling under neon lights) with some friends in Detroit. 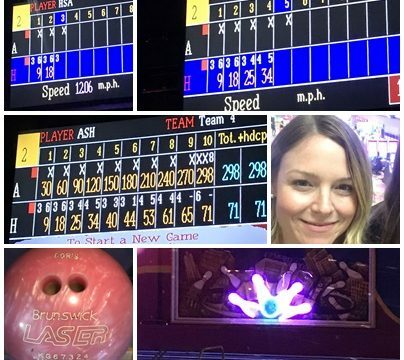 After bowling a game of 107, which is more or less average for Ashley, she proceeded to catch lightning in a jar and bowled 11 consecutive strikes on her way to a 298 and a near perfect game of bowling! Was this pure luck? When you consider she bowled with an 8 pound, plastic, conventional, pink ball…PROBABLY! Ashley was merely 2 pins away from bowling a perfect 300. The odds of the average amateur bowling 300 are 11,500 to 1. By comparison, the odds of being struck by lightning once in a lifetime are only 3,000 to 1. Considering the odds of Ashley feat, we cross-examined her harshly under hot, bright lights, but, she wouldn’t break from her story. 🙂 If you get the chance, CONGRATULATE Ashley on this very amazing accomplishment.